Having done our duty to the other metals in our life, now let’s go back to the sparkly bits that make our days brighter. The rule I learned long ago was simpleÂ not to mix gold and silver jewelry; pretty much no ifs, ands, or buts. These days, though, especially with the current popularity of metallics in fashion, gold and silver and other metals are getting cozy together. The trick, as I see it, to successfully mix metals is to wear at least one piece that includes both metals you might be wearing separately. This takes a hodge-podge of shiny designs and makes it into a definite fashion statement. Another thing to keep in mind is the finish of the metals. If you look at some of the pieces in my Polyvore collage, above, you see that the statement pieces are either all shiny or all “antiqued” or duller and so they look like a planned set. So if you’ve got a heavily antiqued silver bracelet and a high-shine gold necklace, those two pieces might not fit together as well as ones that match to overall look of each. Even though I got rid of most of my yellow-gold jewelry a few years ago when I decided for once and for all that I liked the look (and cost!) of silver better, I do have some gold-tone costume pieces that occasionally work with an outfit. If it’s just a single necklace I won’t worry too much about mixing my metals, but it wouldn’t hurt to have some mixed-metal pieces in my collection to round things out. 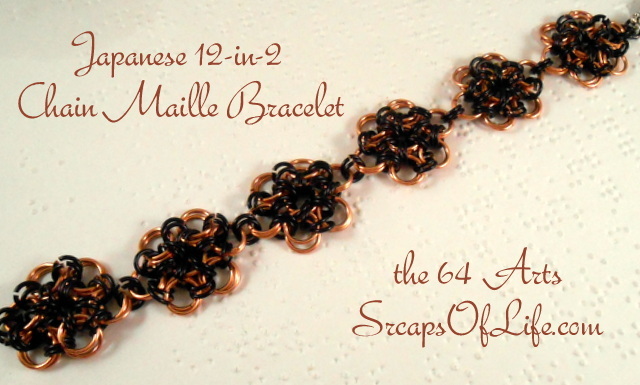 As I was brainstorming post ideas, I couldn’t help but assign myself a task that fulfills one of my long-time craft to-dos: a chain maille bracelet. I’d hoped to be able to find some of the awesome multi-colored aluminum jump rings that I’ve seen made into very nice pieces at craft shows, but our local store was light on the options. 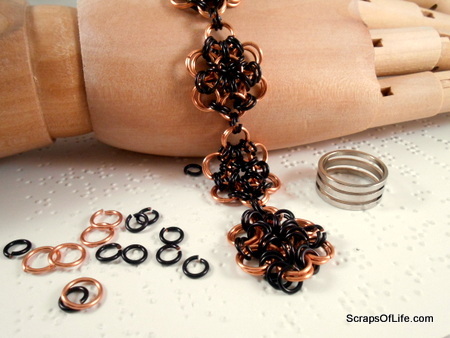 Instead I opted for copper rings in copper and black and picked up a book while I was there on Basic Â & Advanced Chain Maille Â (affiliate links–my book is a combo of the two that I linked to) and had some fun making this bracelet. The instructions for the Japanese 12-in-2 weave comes from the Advanced section, but I really didn’t find it all that hard, to be honest, so don’t be discouraged by that. You can find a lot of weave patterns online, though, and this one is no exception: (12-in-2 instructions via JewleryMakingDaily.com) All I used to put them together was a pair of needlenose pliers and this nifty ring-looking thing called a Jump Ring Opener Â (affiliate link). I have a bad habit of ruining my nails whenever I do wire work and I’m happy to report that this little $2 gadget saved my manicure. I slipped it on my right index finger and it made opening and closing the jump ringsÂ so much simpler with the needlenose pliers in my left hand. Jump rings are finicky, you see–you can’t just pull them apart, you have to twist them open and then twist them back closed to keep their round shape and their strength. You can do it with two pairs of pliers, but the opener makes it oddles easier. I also found out that if I pressed slighting in as I twisted the rings closed, it narrowed the gap at the break, lessening the likelihood of the rings snagging on clothes or letting their brothers loose. It’s one of those things you just have to play with to see what I mean. The bracelet took 6 of the 12-in-2 “flowers” and less than 2 hours to put together, less than 100 larger rings and just over 150 of the smaller (I had to open the second bag but didn’t make much of a dent in it; and I lost some rings when I dropped them and they rolled under furniture–work over something soft and grabby). It’s not very heavy (copper is fairly light, after all, though the aluminum would be like a feather) and makes a pleasant jingly sound when I spin it around my wrist. Which I’ve been doing a lot while I write this post–I’m enjoying my new bracelet. I certainly won’t be making a chain maille bikini anytime soon (or ever!) but it’s nice to finally try out a skill I’ve been putting off for a while. Yes, the metal bikini would hurt a lot. LOL Love this, it is gorgeous!